* Several nice Horses for Sale. We make such perfect matches, your significant other may be jealous. Whether your interest is in performance, classical dressage or simply riding for the sheer joy of it, we've got your mount. For nearly two decades, Moonstruck Meadows has been successfully matching horse lovers with the Andalusian of their dreams. We work with a small, quality group of Revised PRE Andalusian mares, all proven under saddle before they are selectively bred. Our focus is on producing straight-moving, solidly-built horses with sound minds and a good work ethic. Beautiful outlines and baroque features provide the finishing touches. We specialize in horses for adult amateurs. Please contact us for further information on horses for sale. 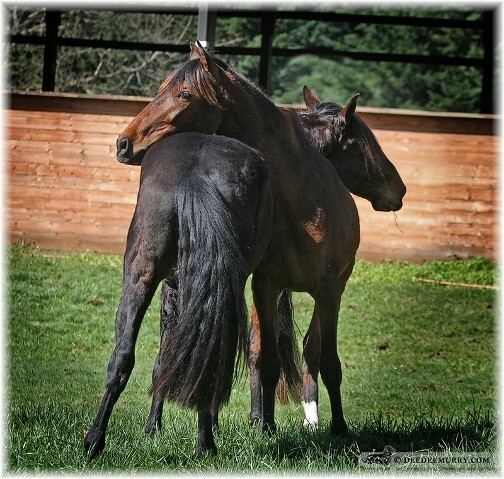 We have in-utero foals, young horses and trained adults available. You might just find love at first sight. Moonstruck Meadows breeds Pure Spanish Andalusians (PRE) for temperament and ridability in addition to correct conformation, health and bloodlines. A Moonstruck horse is an enjoyable, sound companion & competitor. * Mature riding horses available. A Moonstruck dog is a lifetime friend for all occasions & situations. * Year-round referrals for puppies and adults. * Health testing information and resources.